Again and again I am fascinated by interesting photos that booksellers upload to AbeBooks. These photos illustrate listings that I would have otherwise not noticed. The file name of the picture must be identical with the book number of the matching listing, for example 1234.jpg or a293.gif. The picture can then be uploaded via the Members Menu - just as a book file. If you plan to upload a full batch of pictures, put them into a .zip file before sending them to AbeBooks. Our system "un-zips" the .zip-folder and then starts to match your pictures to your listings. You can check your online pictures via the link [Manage (upload/delete) book pictures (gifs and jpgs)] in the [Your Books] menu. Also make sure to check our online help for further information. 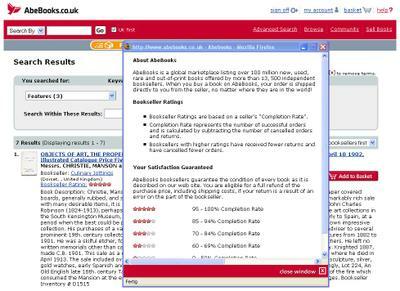 AbeBooks have now released the Bookseller Ratings to buyers. Now, when visiting the AbeBooks sites and placing a search for a title they want, buyers will see sellers star ratings when viewing a book, and can be confident that they are buying from the right sellers. Orders where buyers rejected to pay for Extra Shipping are no longer calculated against a sellers completion rate and will therefore not be be reflected in the star rating. Buyers are now able to see exactly what the ratings reflect. We have also included more "Trust" information for buyers, this includes a bookseller guarantee and also the "AbeBooks bookseller since: ****" feature. AbeBooks will continue to support sellers with low ratings, to help them improve and thereby increase their star rating. services the AbeBooks booksellers provide. 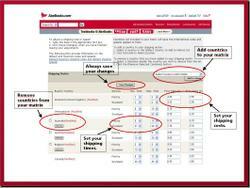 Did you know that you can actually increase BOTH your shipping rates and your shipping speeds? Many sellers use different shipping services and have to ship to many different countries, therefore we have a flexible shipping matrix. This allows you to add and update the information according to the services you use. You can also avoid refunds from processing too soon by setting more realistic shipping speeds. Description parsing allows us to attach certain attributes to a sellers listings making it easier for a buyer to search for their books. The system works by filtering out certains phrases, for example, Dust Jacket, First Edition and Signed from a booksellers data. Should one of those phrases be found within the data of a specific book, it would assign that book to the relevant attribute. These attributes can be seen in the Features menu of the search results and help buyers to further narrow down a search (see picture left). What that means, is that if a seller has included the word or phrase "Signed by Author" for example, within their book description, the parsing system would filter out the word "Signed" and attach the book to the attribute "Signed copy" in the search results. One thing to remember is that the system recognises only certain phrases, therefore if you have entered Signed by owner, the parsing system will recognise signed and attach the book to Signed copy, which usually means that the book has been signed by the author. Should parsing by switched on on your account, we can actually deactivate it to prevent any mismatching occuring. Our Customer Service team will be happy to do this for you. Waterstones have joined forces with AbeBooks on a fantastic new business arrangement, linking their customers to our websites for out-of-print or hard-to-find book titles. 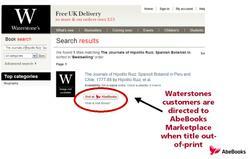 Waterstones will be working with AbeBooks on an affiliation basis, linking their customers to the AbeBooks inventory. A buyer on the Waterstones website searching for an out-of-print title that Waterstones do not have in stock, will be shown a link to AbeBooks. The link will divert them to the AbeBooks website and the list of booksellers offering the book. The affiliation with Waterstones is a fantastic new business opportunity, which opens up our booksellers' inventories to even more potential buyers. AbeBooks held 3 successful bookseller events in the UK at the end of July. Despite some rather treacherous weather conditions sellers made their way to the event locations in Bath, Birmingham and Oxford, for 3 very interesting sessions. A presentation on Bookseller Ratings and some more insight into what AbeBooks do to promote sellers books was given, followed by lively and productive Q & A sessions with those who attended. Other issues addressed included description parsing and also shipping rates and speeds. We also offered some tips on how to use those tools more effectively according to sellers needs. We found that a lot of the sellers who attended wanted more information on how AbeBooks actually promote work to attract more buyers and promote our sellers books. As a result we have actually updated our Bookseller Digest blog with a new category - Marketing & PR - which will be updated with the initiatives we take, and have taken in the past to that accord. We will continue to add more account tips for you, for example, how to update your shipping rates AND speeds, or how best to deal with returns and refunds. How do AbeBooks work for you? AbeBooks have invested in thousands of keywords on the major search engines such as Google.co.uk and Yahoo.co.uk – type in rare books in a google search or antiquarian books in a yahoo search and you will see us high on the search results. We also have a large network of Affiliates working to create sales on AbeBooks. Take a look at Waterstones and WHSmiths see their direct link to the AbeBooks search engine. AbeBooks Europe will open it's doors to the booksellers on September 14th this year. The event will take place at our European headquarters, based in Düsseldorf, Germany and will take place between 15:00pm and 19:00pm, on September 14th, allowing our booksellers to catch a glimpse behind the scenes at AbeBooks. Guest speakers will be present to give talks (in German) on various aspects of the bookselling industry in Germany, and representatives from our German team will be present to offer assistance and tips with booksellers accounts. Do not forget to take a look at the results of the 2006 bookseller survey. Over 3000 international booksellers took part in the survey. We wanted to know how you see the future of online bookselling, so that we can look at how to develop our services to better suit your needs. We were very pleased by the high number of responses received, and kindly thank all those sellers who took the time to complete the survey.